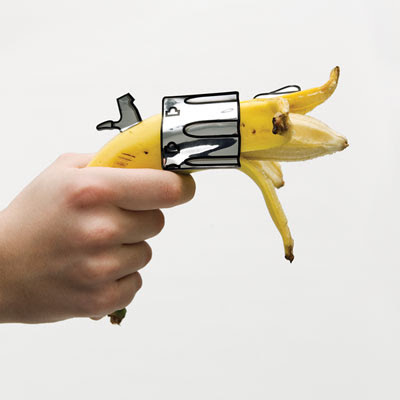 99 Motivators for College Success: Armed Banana robbery attempt fails in N.C.
Armed Banana robbery attempt fails in N.C. Authorities thwarted a guy who tried to rob a store with a banana, but ate it before police could arrive. The 17-year-old held the banana under his shirt when he entered the store, saying he had a gun and demanded money. This caper reminds me of Woody Allen as inmate Virgil Starkwell, trying to make a prison break with a gun carved out of a bar of soap (Take the Money and Run, 1969). Woody should've looked up http://www.weather.com/ for chance of showers, as the gun turned to soap bubbles. Under Georgia Statute, a person commits the offense of armed robbery when, with intent to commit theft, he takes property of another from the person or immediate presence of another by use of an offensive weapon "or any replica, article, or device having the appearance of such weapon." I object, your honor! This trial is a travesty. It's a travesty of a mockery of a sham of a mockery of a travesty of two mockeries of a sham.